Click on the PDFs below to read the 2012 winning essays from Pellston Elementary School students Griffin Landon and Jaden Booth. 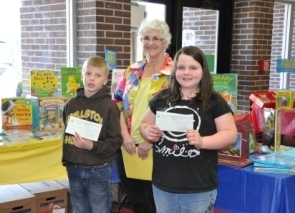 Griffin Landon and Jaden Booth are pictured with Emmet County Historical Commission member Melinda Spencely, at Pellston Elementary School. Two Pellston Elementary School students have been selected as the winners of the third annual Emmet County Historical Commission Essay Contest. Winning first place was Griffin Landon, 8, a third-grader in Kim Wagenschutz's class. He won $100 for his essay about the history of the Mackinac Bridge. Earning second-place was Jaden Booth, 9, a third-grader in Katie Reinhardt's class. Funds for the prize are provided by the Bob Schulze Fund for Creative Writing within the Petoskey-Harbor Springs Area Community Foundation. Bob Schulze was a long-time summer resident of Emmet County who had himself won a similar contest in the 1930s at his high school in Illinois. Ten years ago, his family established the fund. His widow, Sue, serves on the County Historical Commission.